A few weeks ago over stuffed mushrooms and too many bread sticks my loopy carb induced self steered the conversation somehow toward reading. “Remember RIF?” I asked. They did not. “I wonder if they still do that? I don’t ever hear anyone talk about any books their kids bring home from RIF. That was a great program.” Reading Is Fundamental is what the acronym stands for and my knowledge of it boils down to just what I remember from elementary school. Once a year, the RIF people would come with their books and lay them out along long tables in the hallway. Class by class our teachers would march us by the tables to select a book that we could take home for free. Even though that was long ago I remember one year specifically, the year I discovered Bunnicula – the vampire rabbit. Blank stares and raised eyebrows from my dinner companions who’d never heard of Bunnicula and thought I was making it up. After shuffling past the table, I couldn’t decide between Fat Men From Outer Space or Bunnicula. I hesitated. I picked up Fat Men again to read the back cover again and a boy in my class scooped up Bunnicula. Curses! 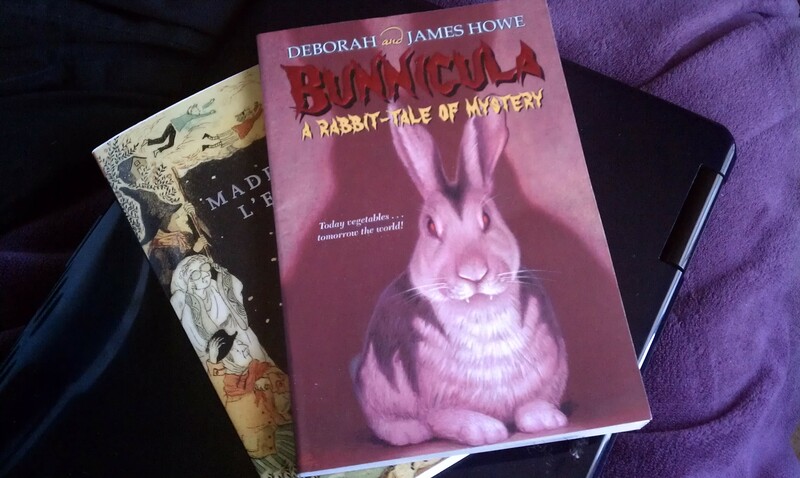 A bit later in class, before I’d even cracked the spine on my newly acquired piece of literary goodness, I decided that I really wanted to read Bunnicula…not instead of, but as well. Sidenote: This was probably the beginning of my propensity for Book Lust – the need to read more than one book at a time. After one or two “No’s” and non compliance with my suggestion that he allow me to read his book first (I promise I wasn’t a bully only blinded by the allure of a vampire bunny) I talked him into letting me take it home “…for one night. And then I’ll bring it back to you tomorrow.” He sucked his teeth at me unbelievingly. “You can take it home, but you won’t be able to finish it all in one night.” Oh, really now. Spurred on by this new temporary acquisition and even further by his challenge as soon as i got home I tossed my book bag aside, promptly planted myself in a chair in the living room directly under the light and began to read. I devoured Bunnicula. I didn’t get up for dinner or anything else until I was finished and God bless that vegetable sucking rabbit I was able to return the book with a smugness in my accomplishment and a nonchalant “I finished it”. After dinner found me in the children’s section of Barnes and Noble looking for a copy of both of those books. They didn’t have Fat Men From Outer Space but they did have Bunnicula (Score!) and a bunch of other titles I recognized. I was overly excited. Apparently my excitement rubbed off on the sales person, she stayed a few minutes longer than she needed to and poured over the titles along with me picking out the one’s she had read. Honestly she was probably more excited than I was. P.S – I am happy to report that RIF still exists and is still the nation’s largest children’s literacy nonprofit in the United States. I am also halppy to report that I have added my name to the petition to ask Congress to support funding for children’s literacy in FY2013 budget. According to the website, nearly two-thirds of low-income families in the U.S own no books and that is a tragedy. Did you read the Mouse and the Motorcycle too? Thank you for your great shared memory of RIF! I hope you will continue to share the RIF story and maintain your strong advocacy for children and books to own and encouragement to read. If you find you will be in our neighborhood at 1730 Rhode Island NW in DC, come to see us! Good morning Carol, Thank you for visiting my blog! i hadn’t realized until visiting your website yesterday that RIF is headquartered in D.C. I just may slide by there the next time I’m in the area! Indeed you must slide by to see us! Give me a call if you know in advance when you will be around…and if I am not going to be here we’ll line up someone “RIF” to visit with you! IF you are ever looking for another employee… this is by far the best person I can nominate… I mean for Halloween, the woman gives kids Barnes and Noble Gift cards instead of candy… and she plays a mean Scrabble… by mean I mean.. I beat her all of the time, but she gives it a wonderful go round. My name is Brian C. James… and I approve this message!! !